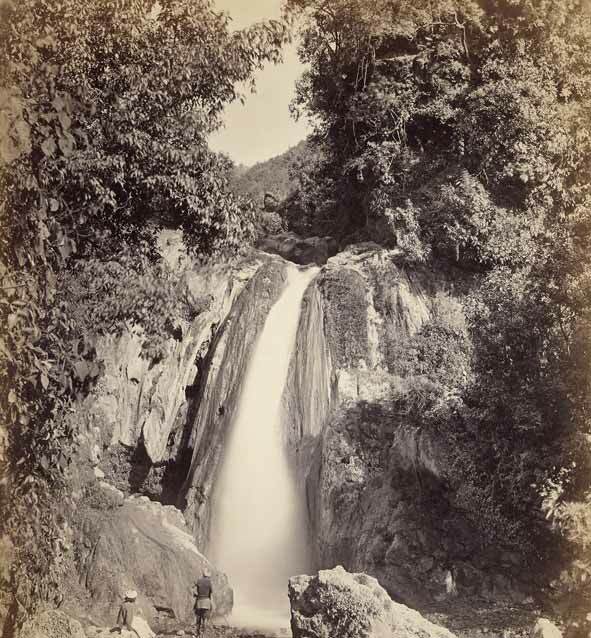 Photograph of the Batta Waterfall below Mussoorie from the 'Strachey Collection of Indian Views', taken by Samuel Bourne in 1866.Samuel Bourne, the bank clerk and amateur photographer arrived in India in 1863 during the early years of commercial photography. Photographs taken during three expeditions to Kashmir and the Himalayas between 1863 and 1866 demonstrate his ability to combine technical skill and artistic vision. These views display a compositional elegance which appealed to Victorian notions of the ‘picturesque’; strategically framed landscapes of rugged mountain scenery, forests, rivers, lakes and rural dwellings.